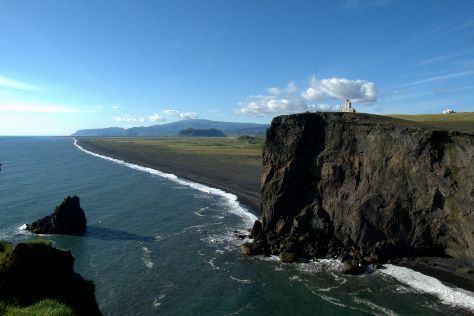 On the 28th (Thu), take in the dramatic natural features at Dyrholaey, then tour the pleasant surroundings at Reynisfjara Beach, then stroll through Black Sand Beach, and finally take a pleasant ride with a tour on horseback. For traveler tips, other places to visit, more things to do, and tourist information, read our Vik day trip tool . Seattle, USA to Vik is an approximately 17-hour combination of flight and bus. You can also do a combination of shuttle, flight, and bus; or do a combination of train, flight, and bus. The time zone difference moving from Pacific Standard Time to Greenwich Mean Time is 8 hours. Expect little chillier temperatures when traveling from Seattle in March; daily highs in Vik reach 39°F and lows reach 35°F. Wrap up your sightseeing on the 28th (Thu) early enough to drive to Kirkjubaejarklaustur. 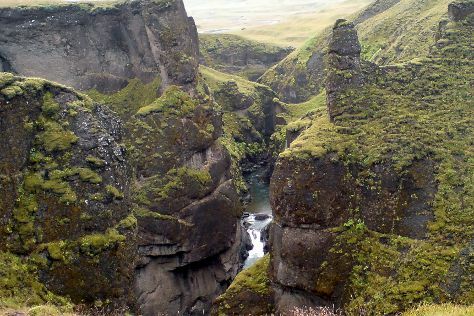 Start off your visit on the 29th (Fri): identify plant and animal life at Fjadrargljufur Canyon, get impressive views of Skaftarstofa, take in the dramatic scenery at Systrafoss, explore the striking landscape at Skaftareldahraun, then admire the sheer force of Stjornarfoss, and finally take in the dramatic natural features at Kirkjugolf. To see maps, ratings, where to stay, and more tourist information, read our Kirkjubaejarklaustur online travel planner . You can drive from Vik to Kirkjubaejarklaustur in 1.5 hours. Alternatively, you can take a bus. Wrap up your sightseeing on the 29th (Fri) early enough to drive to Hofn. Höfn or Höfn í Hornafirði is an Icelandic fishing town in the southeastern part of the country. Start off your visit on the 30th (Sat): explore the striking landscape at Hoffellsjokull Glacier, explore the world behind art at The Thorbergur center, and then get a dose of the wild on a nature and wildlife tour. To see where to stay, maps, and other tourist information, read Hofn trip itinerary builder site . You can drive from Kirkjubaejarklaustur to Hofn in 3 hours. Another option is to take a bus. In March in Hofn, expect temperatures between 40°F during the day and 32°F at night. Cap off your sightseeing on the 30th (Sat) early enough to go by car to Reykjahlid. Start off your visit on the 31st (Sun): explore the activities along Lake Myvatn, take in the dramatic scenery at Dettifoss, and then Head underground at Grjotagja Cave. Keep things going the next day: take your sightseeing to a higher altitude at Mt. Namafjall (Namaskard), then look for all kinds of wild species at Krafla Lava Fields, and then get outside with Vindbelgjarfjall. To find maps, ratings, reviews, and other tourist information, read our Reykjahlid online trip planner . You can drive from Hofn to Reykjahlid in 5.5 hours. Alternatively, you can take a bus. Traveling from Hofn in March, plan for a bit cooler nights in Reykjahlid, with lows around 27°F. Wrap up your sightseeing on the 1st (Mon) to allow time to drive to Akureyri. Start off your visit on the 2nd (Tue): capture your vacation like a pro with an inspiring photography tour, then stop by Flora, Akureyri, and then admire the sheer force of Godafoss. To find ratings, traveler tips, more things to do, and other tourist information, use the Akureyri travel planner . Getting from Reykjahlid to Akureyri by car takes about 1.5 hours. Other options: take a bus. In April in Akureyri, expect temperatures between 41°F during the day and 29°F at night. Wrap up your sightseeing on the 2nd (Tue) to allow time to travel to Reykjavik. On the 3rd (Wed), indulge in some culinary diversions at a local gastronomic tour, take an unforgettable tour with a helicopter tour, and then cast your line with a fishing tour. To see reviews, other places to visit, photos, and tourist information, use the Reykjavik attractions site . Fly from Akureyri to Reykjavik in 2.5 hours. Alternatively, you can do a combination of flight and bus; or drive. In April, plan for daily highs up to 43°F, and evening lows to 32°F. Finish your sightseeing early on the 3rd (Wed) so you can travel back home.